Cpl. Marshall Lee Baily (left) and Trooper Eric Workman were honored at a ceremony Thursday in Roane County. Bailey was killed on August 28, 2012 during a traffic stop. Workman succumbed three days later to injuries stemming from the same incident. Through House Concurrent Resolution 17, the West Virginia Legislature memorialized the officers by naming the I-79 interchange near Exit 34, a bridge, and a stretch of Route 36 in their honor. Gov. Earl Ray Tomblin and State Police Superintendent Col. "Jay" Smithers give the Bailey and Workman families the State Police Cross to honor the officers' sacrifice. The support columns of the overpass on the I-79 interchange have become a memorial for Bailey and Workman. 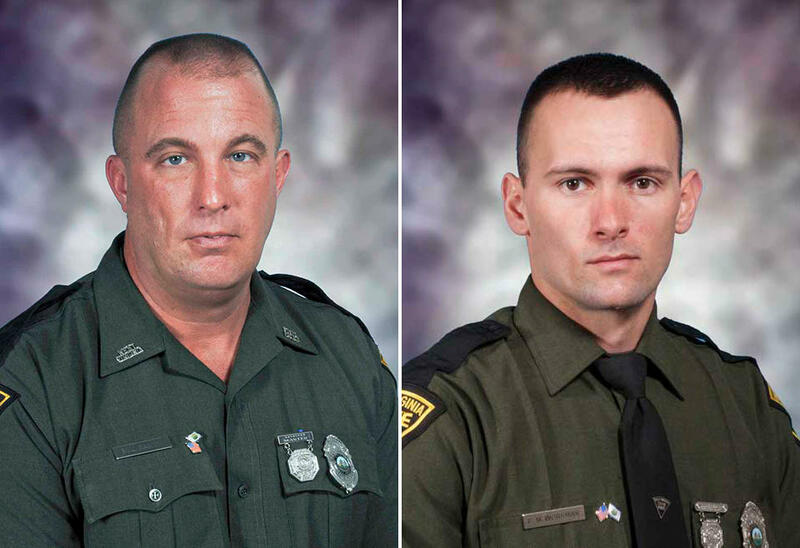 The two officers were killed stemming from an incident that happened along the Roane-Clay County line on August 28, 2012. Many passersby have written messages to Bailey and Workman on the columns as a way to pay respects to the fallen officers. Bailey was killed in the line of duty during a traffic stop on August 28 of last year. Luke Baber of Oak Hill had been detained for reckless driving in a stolen vehicle but, while seated in the back of the cruiser, he accessed a concealed handgun and fired on Bailey and Workman. Bailey was pronounced dead on the scene. Roane County Sheriff's Deputy John Westfall and dispatched tow truck driver Frank Massey were wounded by Baber as a shootout took place. Baber was killed in the shootout and Workman died three days later from injuries sustained in the incident. A year later, families and friends continue to grieve but, as State Police Superintendent Col. “Jay” Smithers put it, all the thoughts and prayers reinforce the bond between West Virginians and fellow law enforcement officers. “We’ve seen it time and time again: West Virginians are always willing to step up to the plate and lend a willing hand when there is a need,” said Smithers. “But, in this instance, folks from far beyond the borders of West Virginia provided comforting word and condolences as well and we thank them for their genuine concern,” he added. Many police officers from out of state attended Bailey and Workman’s funerals. Workman's sister Rebecca and Bailey’s brother Justin also spoke during the ceremony. Bailey fought back tears as he explained the need to celebrate law enforcement officers before it’s too late. “I wish I could say that our family was back to normal. But, I know that will never be the case. There’s not a day that goes by that I don’t think about Marshall,” Bailey said. “In a way, it’s a shame that it takes a tragedy like this to recognize our law enforcement community. They put their lives on the line everyday for our safety and at any minute tragedy can strike." 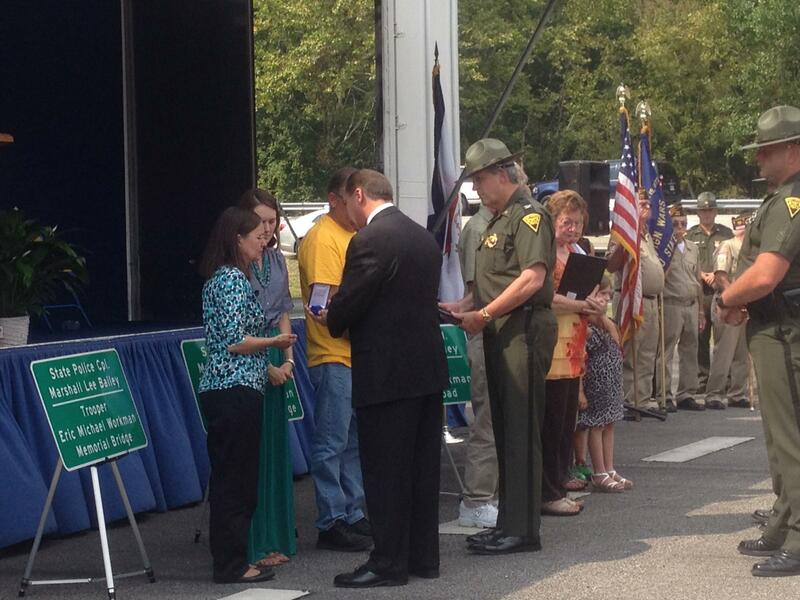 Families of both fallen troopers were presented with the State Police Cross by Col. Smithers and Gov. Tomblin to symbolize the officers’ sacrifice in the line of duty. 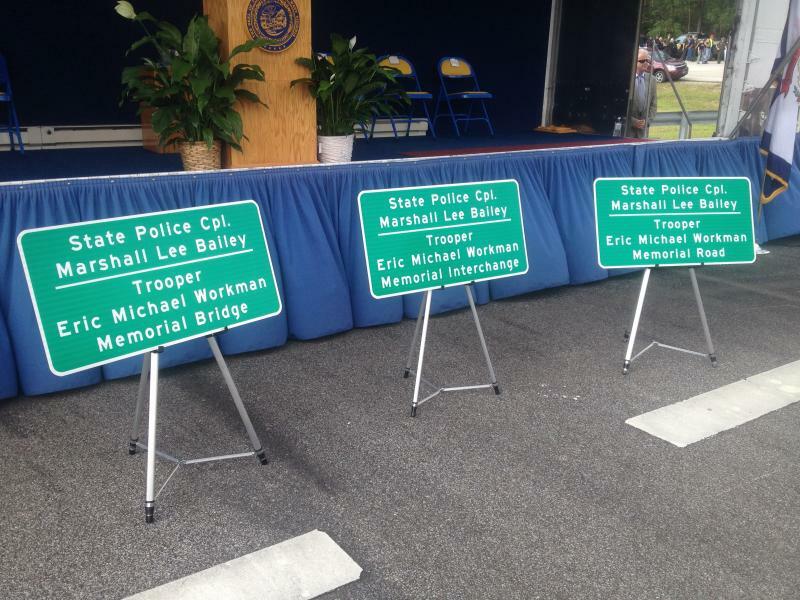 Both families also were given signs marking the memorial bridge. The interchange at I-79’s Exit 34, the bridges at the interchange, and both lanes along a stretch of Route 36 were all dedicated to Bailey and Workman.